Download speeds and mobile internet are ridiculous nowadays, and connecting your phone and over devices have never been simpler either with apps such as Pushbullet, Popcorn Time and Airdroid. After you download a movie or three, you can choose to watch it on your phone or cast the video from your phone to your television. For that, the most popular casting device is Google’s Chromecast and it does a great job… most of the time. When working, I am able to hover over a video where a Chromecast button will appear. However, there are times when I am trying to cast a video file on my phone to my television and the Chromecast icon doesn’t appear in the corner when the video is playing. Without the little Chromecast logo means you cannot connect and the functionality to display on your television isn’t there. Not sure when and why some videos don’t work with Chromecast, or whether specific videos formats are incompatible, I don’t care about that. All I want to do is to play the video on my phone and mirror it onto my TV so I went searching for a solution. Luckily, one came up pretty quickly in my search. Whenever you can’t cast a video from your Android phone to your television — there’s an app for that, as they say. In my particular situation, I downloaded and installed ES File Explorer. 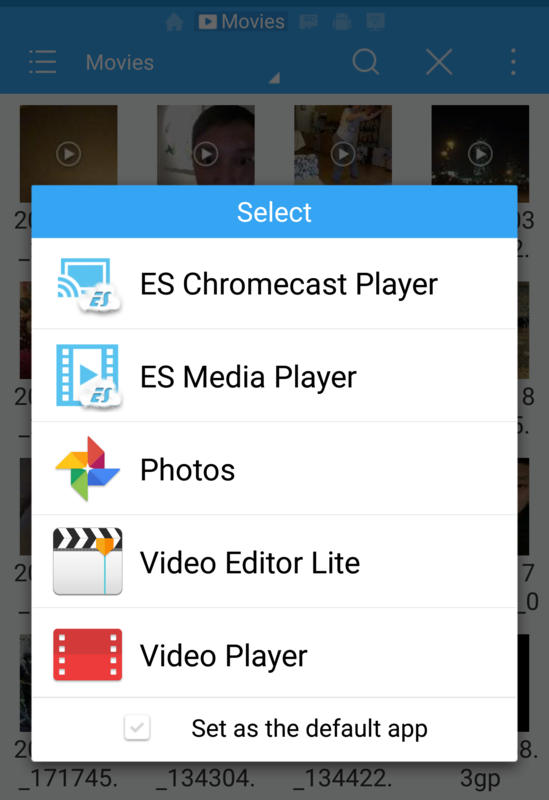 Choose ES Chromecast Player and you’ll be able to cast your phone videos to the television. I’m sure there are other apps that have the same functionality, but this allowed me to play video files on Chromecast from my phone. Good luck!